First impression: What is all this hype about? I have to read it! Okay, I can already hear the gasps and jaw drops...I don't know what took me so long to read this. I have no answer! Am I beating myself up over it now? Yes! I have heard about The Hunger Games since it's release, but the premise never really intrigued me. I just didn't think it would be my cup of tea. Then of course, as the movie news started circulating, I got an idea of how many people adored this book and series. Finally, the trailers were released and the whole Internet world was buzzing about The Hunger Games. I must admit, that I was just as antsy to see the movie. The trailer sold me. I must read the book before I see it right? So, I finally did. Boy, am I annoyed at myself for not picking it up sooner! The character that is Katniss Everdeen is truly a one of a kind person. Dealt a very hard hand in life, she is strong and independent. She is a provider for her sister and mother and she is a survivor. At times, I envied her courage and strength. Suzanne Collins did a tremendous job at penning Katniss and I hope she knows that. In fact, she did a tremendous job at creating all the characters. Peeta, the boy with the bread...He is strong on the outside and vulnerable on the inside. He wears his heart on his sleeve. What you see is what you get with Peeta. The heart-pounding suspense was almost too much to take a first. I just wanted to skip to the end of the chapters to learn the outcome. I love that Suzanne Collins didn't sugar coat one moment in this book. She depicted the ugliness and absolute horror of The Hunger Games in a stunning way. What a vivid picture she painted! At times, yes, it was a little gut-wrenching, but that made it all that more suspenseful and raw. 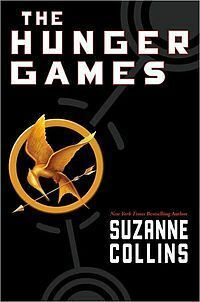 I am happy to say that I FINALLY read The Hunger Games. I look forward to devouring books 2 and 3 in the series now and learning more about these fantastic characters. Next on the agenda, the movie! Final impression: *Slaps hand to forehead* Why did you wait so long? Loved it! The Crazy Bookworm wants to know: Have you seen The Hunger Games movie yet? Yay, you finally read it!! --I read it before all the buzz & hype and due to the young violence I didn't give it a 5 star but amazing book nonetheless. --I take it you're Team Peeta ..understandable ..he's got the bread! --Well done on your review. --Nope I haven't seen the movie yet but I will. I wasn't that interested in it until my son passed it on to me and said it was a "must" read. I'm glad I did she is an amazing author. Finally!! I know! I was one of those who just read all three, mostly because of all the hype and the release of the movie, which I am going to see tomorrow! I loved Hunger Games and am so excited to go to the movie!! I felt the same way when I finally read it so I completely understand. Hungry for The Hunger Games Giveaway Part 2! Your pick: What should I read next? Hungry for The Hungry Games?